Extraterrestrial сivilizations are warning about soon beginning of natural disasters. However, they do not occur by chance. It turns out that the onset of global cataclysms on Earth is a manifestation of the General Law of development of the planets in the solar system. That is why this process can not be neither stopped, or changed. Our planet will not be just shaked or flooded with water, but the Earth, principally, will stop to exist as a place suitable for living organisms. No one can survive, and even ultra-deep bunkers will not help. There is only one exit – the Transition on the other safe level of the material world. ETC claim that humanity can be destroyed in global catastrophes, because does not understand the laws of nature. ETC reveal the regularity of development of the planet Earth, as well as the solar system and the universe. They report that the universe is a unified system of consciousness. Stars, planets, black holes, galaxies and other cosmic objects - are separate systems with different mechanisms of consciousness improvement. Looking at the incredible beauty of the night sky with sparkling stars, you will never think that nuclear and thermonuclear reactions raging in depth of their subsoil are one of mechanisms of consciousness improvement. As it is known in the solar system there are two groups of planets – terrestrial and gaseous. Extraterrestrials inform that the presence of these two groups is related to the development of consciousness. It's the planets of the past, present and future development of consciousness. The evolution of consciousness in the solar system occurs in the direction towards the star. Saturn, Uranus, Neptune and also Pluto and Mars. On all these planets the stage of consciousness development has already finished, and they are subjected to destruction. In the solar system we see different phases of this mechanism – from the very beginning up to the end. 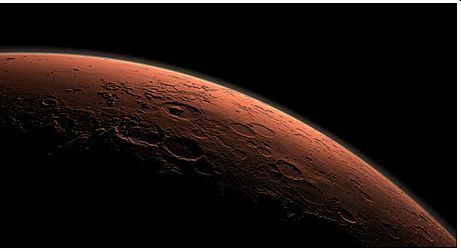 The beginning of the process is presented on Mars, where the mechanism of destruction of the planets has been running at full speed. However, in the initial phase. The planet Mars has passed to the category of «planets of the past development of consciousness» quite recently and processes of destruction didn't manage to transfer it into the category of gas planets. Therefore Mars meanwhile belongs to the terrestrial planets. On Mars had completed just only the first stage – the leveling and «loosening» of the surface – preparing for its inflate. The processes of destruction that will soon transfer this planet into the category of gas planets, work in the bowels of the planet yet quietly, but very rapidly. However, meanwhile they aren't shown in the form of increased volume of the planet. Nevertheless, already now on Mars are observed the strongest dust storms in the solar system. The samples delivered from Mars show that once Mars had strong magnetic field, however, now it is almost completely absent. Photos taken from the surface of the planet prove that Mars once had a lot of water. On the photos can be seen surface run-off in hundreds of locations, dried deltas of rivers and subsurface seepage of water. Today, almost all the water has disappeared, as scientists believe, due to the decrease of the magnetic field, cooling the planet and thinning of the atmosphere. Underground water is converted into vapor or ice immediately after reaching the surface. Currently, water on Mars exists in the form of ice of the north polar caps and also as vapor in thin clouds. The planet Earth with the start of global cataclysms, incompatible with the life of organic nature also will transfer into the category of the planets of the past development of consciousness. Gradually, Earth will look like Mars, but then will transfer into the category of the gas planets. Pluto represents the last stage of the destruction of the planet in the solar system. This is the planet of deep past, from which only the kernel has left. Scientists have already transferred it into the category of «dwarf planet. » In addition, Pluto has no longer a circular trajectory, like all the planets in the solar system, but elliptical, which crosses the orbits of some planets. Planets of the future development of consciousness are Venus and Mercury. The improvement of consciousness on these planets will take place in the near and distant future. First, on Venus, and then – on Mercury. So Venus is preparing to receive organic life and human being. Mercury is the planet like a compressed bud. On this planet organic life and humanity will appear in a very, very long future – only after the cycle of consciousness improvement on Venus. These forms of higher consciousness require certain conditions of life, which gradually, over many millions of years are created on the planet. The planet of the present development of consciousness is the Earth, because the improvement of consciousness on it occurs at the present moment. So, the planets of the future development of consciousness represent different stages of transformations occurring on the planet at the preparation for the adoption of organic life and human beings. The planets of the past represent all the stages of the planet destruction after a full cycle of consciousness development. The mechanism of destruction of the planets in the solar system is one and occurs on a certain scenario, which consists of several stages. Stages follow each other, while on each of them is running particular mechanism of destruction. Complete destruction of the planet's until its core continues millions of years. The process of destruction of the planet in the solar system ends when remained from the planet core changes its orbit of rotation around the Sun from circular to elliptical, breaks off and goes into space. The evolution of consciousness in the solar system occurs in the direction towards the star. In the same direction occurs also the destruction of planets. The first phase of the planets destruction in the solar system is presented on Mars, and the final stage – on the dwarf planet Pluto, which is its core. Let’s consider the stages of the planets destruction in the solar system, and the mechanisms by which it happens. The first phase of the planet’ destruction. The process of the planet’ destruction begins with its shaking by global cataclysms of incredible strength aimed to leveling of the planet’ surface, that is, transformation the mountains in piles of sand. The first phase lasts for several million years. When the first stage of deep universal destruction of the planet’ solid surface by global cataclysms comes to an end – the second stage begins. The second stage of the planet’ destruction. In the second stage simultaneously develop the two processes. On the one hand, occurs the destruction of the internal structure of the planet with the help of reactions similar to reactions of carbide with the release of gases. As a result, the planet is slowly inflated in the sizes and from the terrestrial turns into a gaseous. As it is known, in the atmosphere of the planets of the past development of consciousness – gas planets Jupiter, Saturn and Uranus, is discovered acetylene – the product of carbide reaction. 400 km/hour, i.e., about 250 miles/hour. The strongest winds in the solar system are blowing on Neptune - the last gas planet. Their speed is sometimes greater than 2,000 kilometers per hour. Ending of the process of the planet’ destruction. From gaseous planet at some stage remains only one core. This end of the process of the planet’ destruction is presented today on Pluto. By this time the circular orbit of the planet is gradually drawn out, turning into an elliptical. This leads to the following. The core of the planet that can not be inflating by the wind gradually farther and farther comes beyond the limits of the solar system, and finally breaks off and goes into the space. There it will be destroyed as space debris by special mechanisms. A similar situation will happen soon with Pluto also. The function of the universe’ cleaning does the black holes. They are the vacuum cleaners of the universe. Thus, according to the algorithm of consciousness development in the solar system, there are three types of planets – past, present and future development of consciousness. After the end of the cycle of Consciousness the planet is subjected to be destroyed, and humanity has to make the Transition into the harmony of the same planets in the new cycle of life – in the cycle of Correction to continue development of consciousness. If humanity will not make the Transition in time, the whole planetary system is completely destroyed. Fast destruction of planetary systems with a breakage of the cycle of Consciousness. In the universe there are mechanisms of the fast destruction of planetary systems, in which the process of consciousness development was broken. 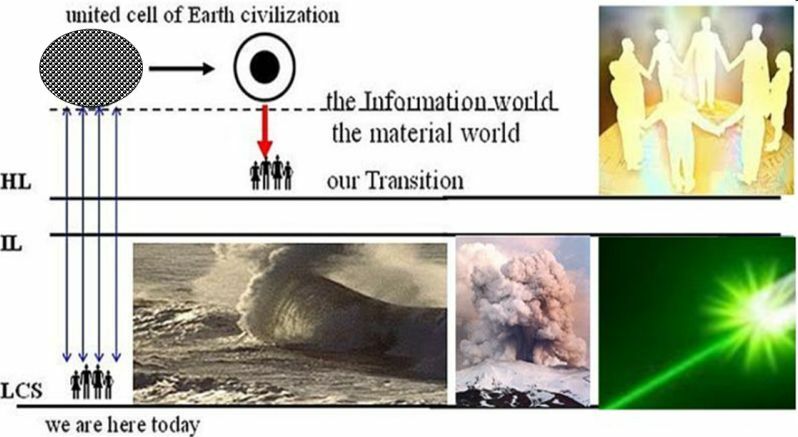 Interruption of consciousness development means that civilization has not made the Transition in the next cycle of life in time and was destroyed with the beginning of global cataclysms. 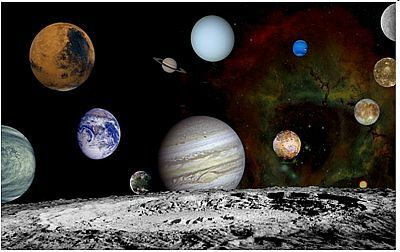 Planetary systems both long and short are designed for the transition of evolving consciousness from planet to planet in the direction towards the star. Each system of consciousness has its own unique code, which contains a set of unique characteristics. 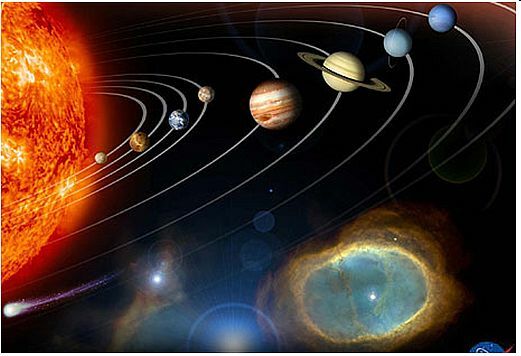 They include: location of the galaxy, in which this planetary system is located in the universe, the shape of the galaxy, the place of the location in it of the given planetary system, the number of planets in it, and other characteristics. Breakage at any stage leads to the fact that in this system will never develop consciousness. It is impossible to create another system of consciousness with the same unique code, that’s why the planetary system with incomplete process of consciousness development is subjected to the total and rapid destruction. For this purpose are used the black holes which are located in the center of each galaxy. Today the Earth passes from the group of the present development of consciousness into the group of the past and therefore, it will be gradually completely destroyed by more amplifying global cataclysms. Extraterrestrials are confident that no matter what, humanity has the strength and intelligence to make the Transition before the beginning of global cataclysms. They are absolutely sure. The beginning of global cataclysms is the result of deep processes affecting the foundations of our planet. There is no doubt that such a process can not occur overnight. It is the result of the critical state of many natural processes on the planet. Let's see what harbingers of nature point to the critical state of the planet before global cataclysms beginning. Do you know that in just four days in July 2012 Greenland glacier melted on 97% in hight about 3.5 km in the center of the island and an area of 972,000 sq. km. NASA scientists note that the rate of melting of Greenland ice is unprecedented. So, on July 8, 2012 in Greenland melted only about 40% of the ice cap, and July 12, 2012 already 97%. Even at the highest point of Greenland glacier near-zero temperatures have led to the melting of ice. On images are shown the data from three satellites – state of ice cover of the island on July 8 (left) and July 12 (right), 2012. Rapid melting of ice in the summer of 2012 in four days in Greenland became an incredible sensation in the world and noted by scientists as «extraordinary». Typically, in the summer months are usually melted almost half the Greenland ice sheet. The rate and extent of melting this year is phenomenal. Moreover, there was a split of Petermann glacier and broke of giant iceberg 120 sq. km area, which is twice the size of Manhattan. In 2010, from the same glacier broke another big chunk of ice of area 260 square kilometers, about a thousand kilometers from the North Pole. Petermann glacier is the northernmost glacier in the world, which is located in the north-east of Greenland. Part of it is drifting on the water, and some is located on the land. Ice covers 80% of Greenland, which most part lies behind Polar circle. Scientists believe that the full melting of Greenland ice will lead to a rise in sea level on 6.4 meters. Apocalypse from Greenland. Modeling variants for further record acceleration of melting ice in Greenland in 2012, many scientists believe that mankind is threatened by environmental disaster and apocalypse is already inevitable. Full melting of the world's largest ice island will lead to the destruction of organic life on the planet. About it warns the model of Nicholay Zhavrin, the candidate of geographical sciences. This model consists in the following. As it is known, the earth crust bends under the weight of any array of even a small artificial reservoir. Under the weight of trillion tons of Greenland’ glacier this deflection downwards is about 1 km. However, as a result of global warming glacier is gradually melting, i.e. ice mass decreases. Scientist predict that «as a result of a complete melting of the glacier will move earth’ lithospheric plates, bended under the weight of ice, and will lift the entire edge of the North American plate on about 1 km. It is known that lithospheric plates cover the entire globe. When the Greenland ice melts, the plate in the region of Iceland rises to hundreds of meters. As a result, will be violated a snug fit of the North American and Eurasian plates and formed a huge rift in which will rush huge mass of water. Under the lithospheric plates is located the Earth upper mantle, whose temperature reaches 1200 º C.
Huge masses of cold ocean water will rush to the rift with molten lava of the upper mantle. It is similarly as if on a giant frying pan to splash cold water. This will lead to an explosion of space of cyclopean power – said the scientist. In such circumstances, the water instantly turns to steam, and due to the laws of physics will expand in almost 2,000 times. Then, squeezed and pressed steam in the form of huge explosion will escape through the thickness of the ocean and lift on 20 km into the stratosphere of the planet large amounts of volcanic ash and gases of the Earth’ mantle. The evaporated water will form a huge horrible black cloud, which will be shed on the Earth as strongest biblical rain. During the steam explosion the ocean will be severely troubled. Tsunamis will occur, which height will be from one to three kilometers – differently in different places. The feature of this event will be in arising of an underground chain reaction in the rift system along the entire length which is about 80,000 km, making explode volcanoes. Rift, as it is known, is a break in the earth's crust which expands with time. Global rift system of Earth is a ribbon of underwater volcanoes that encircles the planet across continents and oceans. The main part of the global rift system passes through the Earth's mid-ocean ridges - the main structural element of the oceans. This is line mountain structures on the bottom of the oceans, forming a single system, enveloping the whole globe. These ridges continue one another, and in several places are connected by «triple junction», as, for example, in the central Indian Ocean. Total length is about 80 thousand km, width – up to 2000 km, height - 3000-4000 m, the highest peaks even rise above the ocean in the form of volcanic islands such as Iceland. 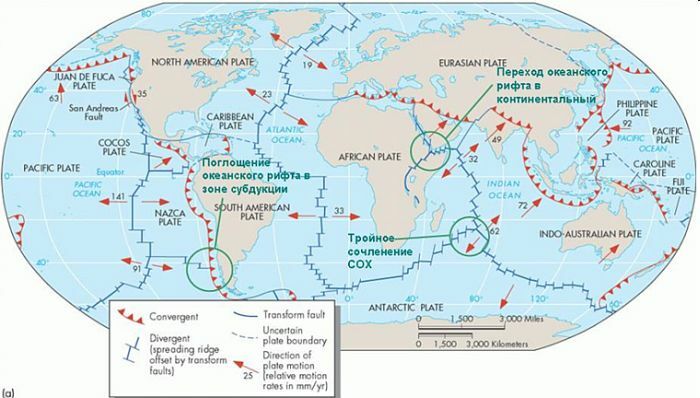 Most of the global rift system is in the oceans, where is expressed by mid-ocean ridges, characterized on all length by high seismic and volcanic activity. However, in the rift system there are passive and active areas. Active areas are characterized by expression of active seismic and magmatic processes. They include deep-sea trenches, most clearly manifested in the Pacific. Thus, the global rift system of the Earth is a single huge underwater volcano 80,000 kilometers long. The figure shows the lithospheric plates and junction of rift zones with each other. «After in the global rift system of the planet the volcanoes will start to explode will arise giant tsunami waves up to 10 km in height, which will pass on thousands of kilometers on all seas and oceans, destroying cities. Giant super-tsunami will go over the British Isles and in the Baltic basin will wash off Norway, Sweden and Finland. The second edge will go towards America. Passing over low Appalachian Mountains, it will flood the valley of the Mississippi River, destroying everything on its way. They will affect the whole of Russia – from edge to edge. Britain, most of North America and Western Europe will be destroyed » – predicts Academician N. Zhavrin. He notes that no one knows when it will happen in two years or 20 years, but one thing is clear – a catastrophe is inevitable. The rapid melting of a massive glacier in Greenland indicates on a rift of tectonic plates. The rapid melting of a massive glacier in Greenland – just in four days – indicates that a break of tectonic plates has already occurred, and through the cracks began to come out hot air from the top of the upper mantle with temperature of 1200ºC. Thus, the record-rapid melting of ice took place on both sides. From the top – as a result of thinning of the ozone layer and the formation of ozone holes, and from the bottom – under ground – due to the high air’ temperature of hot mantle of the planet passing through the break of plates. The process of divergence of tectonic plates did not start this summer – it only revealed clearly in 2012 due to a large break, through which pulled out a significant flow of hot air from the interior of the Earth. It was the rift who caused this rapid melting of glaciers. This process has been going on for several years since the imbalance position of the two plates - the North American and Eurasian, as a result of a critical degree of glaciers melting. Began process of breaking off huge masses of ice in the form of giant icebergs also reveals the process of passing hot air through the same break of plates. Recent scientific data show that under Antarctic is also a deep crack, which contributes to the rapid melting of glaciers. In this case, such a weak manifestation of the resulting break of plates in July 2012 - just as a glacier melting, although at in a record rate – happened due to partial melting of the Greenland glacier. Considering global critical weakening of the planet’ magnetic field, it is clear that in the nearest years Greenland glaciers will melt significantly more, and then the model of N. Zhavrin with giant super-tsunami will become a reality. ETC call humanity before life-threatening hazards to make the Transition to a safe level of the material world as the only way of life prolongation. The development of the world can not go backwards. It is obvious that melting of glaciers in Greenland is will not stopped, but will only increase, because it is connected with a critical weakening of the planet’ magnetic field. Earth is a dipole and develops according to the hysteresis loop. Our planet has already completed the cycle of magnetization - the lower branch, crossed the beak, and now is at the demagnetization branch of the hysteresis loop – the upper branch. The development of the planet can not go backwards, so the magnetic field can not increase. The weakening of the magnetic field will continue on up to the beginning of global cataclysms and overturn of the poles, leading to the complete destruction of the organic nature and humanity. This is due to the fact that the Earth has entered into a phase of active total destruction of the planet. Human life can be extended only through the Transition to a new cycle of life. The North magnetic pole increases the speed of shift. In the early twentieth century the North Pole shifted with a speed of 10 km per year. In 2009, the rate of movement of the North Pole was 64 kilometers per year. In 2012 speed of shift of the North Pole became a record. It is now in Canada and moves to Russia. 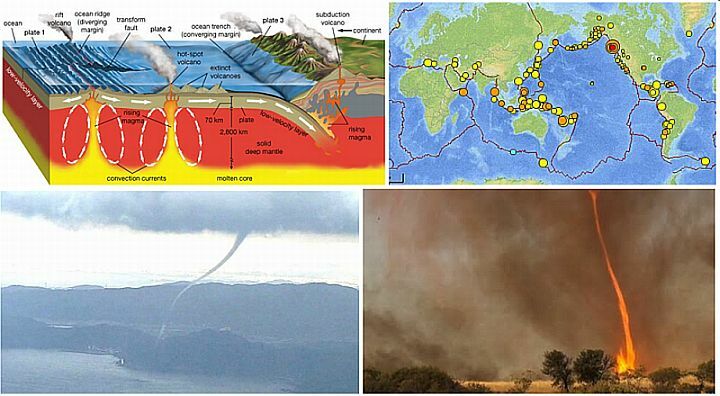 Activation of the processes in the bowels of the planet happen due to the weakening of its magnetic field: increases the activity of volcanoes, become more frequent flooding, earthquakes, hurricanes and other natural disasters around the world. Thus, in July 2012, almost simultaneously with the unprecedented melting of the Greenland ice happened activity’ increasing of the calm, stable volcano in Japan Sakurajima. On July 27, 2012 the level of danger was 3.5 out of five, that is, approach to the volcano is impossible, but evacuation is not required. In late October 2012 on the east coast of North America swept the most destructive hurricane Sandy. Sandy hurricane and tsunami 2011 in Japan clearly showed that humanity go through any, even the weakest blows of nature and just trying to adapt to natural disasters. However, to adapt to the tsunami of 1.5-2 km in height is impossible. This is just one type of natural attack, escape from which, apparently, can be found in bunkers deep underground. However, subsequent multiple breaks of the crust and the powerful earthquakes will destroy even the strongest bunkers-fortresses as if cardboard houses. The transition to a safe level of the material world – is the only way to do. GulfStreamstopped? What happened to the Gulf Stream? Gulf Stream is a «river» of warm water that moves through the Atlantic Ocean, reaching Murmansk. More precisely, the Gulf Stream is a kind of jet stream, strongly meandering band in the ocean, in width of a couple of hundred kilometers, which is filled with moving vortices. For millennia, the Gulf Stream warms the Europe, protecting it from the icy polar winds. Because of the Gulf Stream stopping Arctic winds will pass freely across Europe. According to many scientists, within the next few years may start an ice age. Ozone holes reveal unprecedented weakening of the Earth’ magnetic field. Process of continuous weakening of the magnetic field of Earth people are watching already for a long time. It manifests itself in the emergence and constant expansion of the ozone holes, which for over 25 years occurred annually over the South Pole of the planet, reaching enormous sizes. In 2011, the ozone hole of unprecedented sizes has emerged also over the North Pole – the Arctic, indicating thereby that the planet's magnetic field weakened extremely strong. Extraterrestrial civilizations persistently warn about soon beginning of global cataclysms. On the unprecedented weakening of the magnetic field indicates an increase in the upper permissible level of UV-index, melting of ice shelves, mass deaths of whales, dolphins, fish and birds around the world, etc. UV-index today broke all records. Due to the weakening of the magnetic field of the planet is observed thinning of the ozone layer. As it is known, the ozone layer protects life on Earth from the ravages of ultraviolet solar radiation. As a result of continuous reduction of the ozone layer arise ozone holes that expand over already more than 25 years. In the last decade they have reached unprecedented sizes. According to this process to warn people about the level of ultraviolet solar radiation on the planet has been introduced so-called UV-Index. Along with the expansion of the ozone hole to incredible size has increased dramatically also the UV-Index, therefore, taken before the maximum allowable for the health and life of ultraviolet solar radiation doses were significantly increased. Thus, the maximum permissible value of UV-Index – first 10 units has been replaced by 12 and later to 11 +. 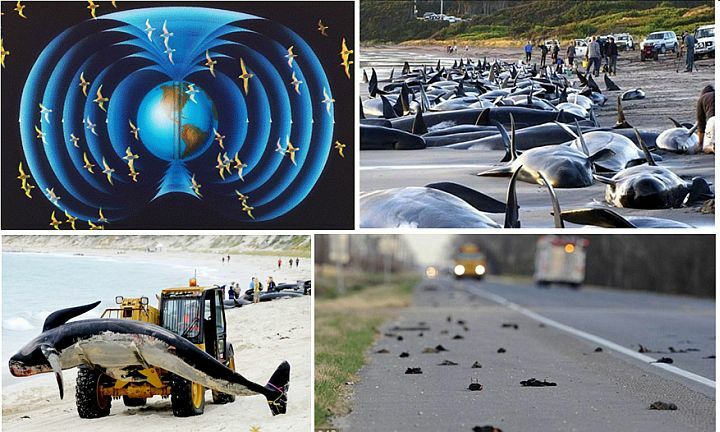 Mass deaths of whales, dolphins, penguins, birds and fish around the world. Critical weakening of Earth magnetic field causes a failure in a biological compass of whale dolphins, fish and birds and causes them to mass death throughout the world. This sad phenomenon is recently observed very often because they are oriented in space according to the planet’ magnetic field. This process occurs especially vividly in areas with weak magnetic field - on the southern coast of Australia and Oceania, on the shores of Tasmania and the adjacent islands, and others. Scientists note that Tasmania is the first in the world in the number of such tragedies. The weakening of the magnetic field was manifested in the mass deaths of whales and dolphins, which are thrown ashore by failure of their biological compass. Over the past nine years here have thrown on the shore more than half of the marine animals who have died by this way all over the world. The death of over 2 million animals in July 2012. Beginning from 2010, the beaches around the world have been covered by dead representatives of the marine life. Birds and fish were dying en masse, which has never been reported before. These events occur throughout the reservoirs, rivers and oceans. Only in July 2012 were recorded data on deaths of over 2 million animals worldwide. These are swans, crabs, fish and green turtles. Recently, as the cause of death, scientists often name methane, which level has increased because of shifts in the earth's crust; so, gas rose upwards and poisoned congestions of birds and fish. 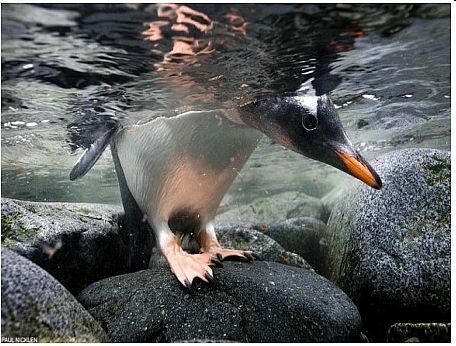 The death of penguins as a result of the displacement of ocean currents. More than 500 dead penguins have washed up on the beaches of Rio Grande do Sul in Brazil. No injuries or oil spots on the plumage of birds were found, they all well fed. Scientists explain this event by shift of ocean currents and very low temperature. Melting of ice shelves in Antarctica, giant icebergs in the South Atlantic. On September 29, 2012 NASA satellite photographed in the South Atlantic two huge iceberg near the island of South Georgia. According to NSIDC giant iceberg C-19C, with size 35 by 28 km and the iceberg B-15F with size 35 by 7 km are the remnant of icebergs that split from the Ross Ice Shelf, respectively, in May 2002 and in March 2000, i.e., they are fragments of the ice continent. The presence of icebergs in the South Atlantic is already commonplace. It is known that, in January 2004. in this place there was pandemonium of icebergs that even block navigation. In the ice shelf Pine Island in Antarctica is discovered a major break. This crack with length of about 30 km means calving of new a huge iceberg. The thickness of ice in Antarctica is reduced to 7 meters per year. Antarctic ice armor decreases rapidly due to the quick melting of its grassroots layers contacting with the water. Rift break under Antarctica. British scientists have discovered a giant rift valley under glaciers in western Antarctica. Experts believe that the break of 1.6 km depth and the size of the U.S. Grand Canyon may be related to high rates of ice melting in the region. A deepening in the earth's crust is located under a glacier Ferrigno, which stretches for 28 km, to the Gulf of Eltanina at Bellingshausen Sea in West Antarctica. «It is particularly important that (discovery) of the break perfectly coincides with the data on the reduction of the thickness of the ice surface. We observed melting of the ice, over this region from satellites throughout last 20 years » - noticed the leading researcher of the project, professor of the University of Aberdeen, Robert Bingham. Thus, in the western part of the continent, where the break is located, at present there happens the most rapid melting of ice, compared with the other areas, which thickness is quickly reduced. Antarctica has set a record of high growth areas of the ice. Antarctica – the South Pole is experiencing record of high ice growth. In the Arctic - the North Pole - on the contrary, there is a record decrease in ice territory, the area of the melting ice has broken all records. Thus, according to NSIDC – leading the U.S. National Center for monitoring snow and ice, on September 26, 2012 Antarctica was surrounded by the largest area of sea ice ever recorded in the region – 19.44 million square kilometers. This is new maximum are of sea ice in the Southern Hemisphere. The picture by a yellow line shows the average index, i.e., normal area of Antarctic ice from 1979 to September 2000. The previous record came in 2006 and was 19,390,000 square km. Stratosphere over Antarctica is colder than usual due to the depletion of ozone and ozone holes. In addition, there significantly increased winds, blowing from the interior of the continent. All this also contributes to ice buildup. Antarctic phenomenon - «the Ice finger of death.» Depletion of ozone and expansion of ozone holes led to the formation inside the ocean narrow streams of extremely cold (almost frozen) very salty water. Formed under the surface of the ocean, ice stalactites are growing rapidly, penetrating the ocean deep from the surface to bottom, turning to ice everything on its way. The process of forming 4-ice stalactites with a very high speed filmed BBC cameramen with the help of underwater cameras installed near the volcanic Ross Island. Curdling salt stalactites falling form a rapid torrent of salt water, which turns to ice everything in its path. 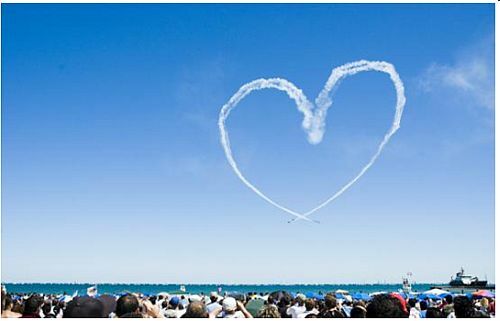 The water of the jet has much higher density than the rest of its surrounding ocean water, and also the temperature of the jet is much lower, i.e. it is colder than ice. 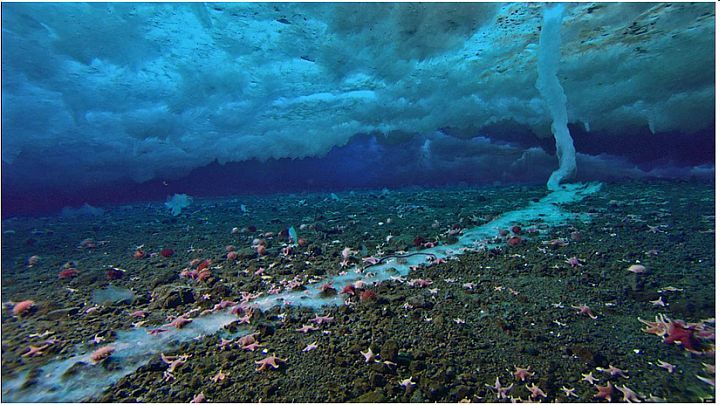 All the ocean animals (starfish and other ocean organisms) gradually fall into this trap of ice and turn into ice. Scientists call this phenomenon «brinikly» and cameramen who observed it – «ice finger of death». Thus, today, record-catastrophic changes in the nature of the Earth and activation of processes in the bowels of the planet happen. All this is the result of the weakening of the planet’ magnetic field. However, mankind is blind to the clearly phenomenal anomaly of the nature, hoping that somehow it will stabilize, and in our times heavy accidents will not happen. So, many people are thinking this way, hiding like an ostrich head in the sand. The destruction of Pompeii. In its life, humanity has repeatedly met with the menacing phenomena of nature. The most prominent mark in history has left the eruption of volcanic Vesuvius, located near Naples in southern Italy. It led to the death of Pompeii - wealthy Roman city with a population of 20,000 inhabitants, where many noble Romans had villa. Mad nature had destroyed thousands of lives. The eruption of Mount Vesuvius, which occurred on August 24, 79 AD and lasted about a day, did not start suddenly. On the one hand, on February 5, 62 AD, i.e. several years before the events a powerful earthquake happened. On the other hand, a lot of precursors were just before the eruption of the volcano, and even directly in the course of the event. However, city dwellers have never experienced the same phenomenon of nature and therefore do not understand the extent of its danger. Within 18 hours bowels of erupting volcano threw out billions of tons of rock and ash, and finally enveloped the earth with poisonous gas, which strangled the last of the survivors. Did not have time to leave Pompeii only those people who did not believe that the volcanic eruption was mortally dangerous and could completely destroy the city. Some rich men of the city, instead of escaping, wasted precious time for packing of their wealth. 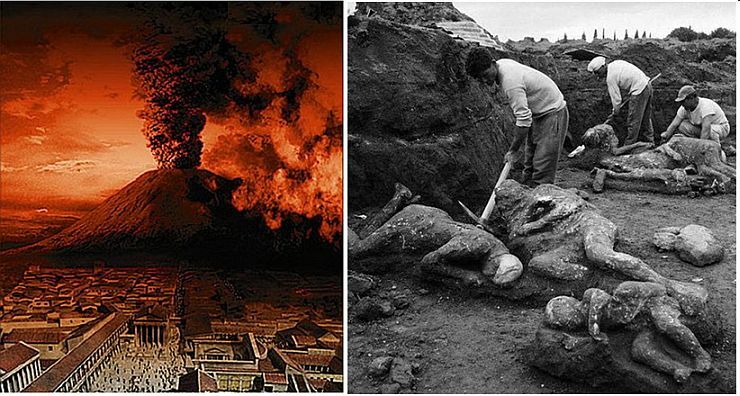 Thus, such a huge number of deaths happened due to the fact that living in a dangerous area people were not informed about the occurrence of the most powerful natural disaster – the volcanic eruption of Mount Vesuvius. Even if they do not understand the power of natural disaster, but would be warned, many people would have survived, because they could leave the danger area in time. Today humanity is trying to understand the secret signs of the planet, which might point to its critical state. Extraterrestrials, in turn, inform of the need as quickly as possible to leave the level of the Crystal Structures, where we now live. They confirm that in the near future there will begin global cataclysms of planetary scale, the strength of which is incompatible with the life of humanity and organic nature. They give humanity the necessary instructions for the continuation of life. ETC inform that overturn of the planet’ poles of the will not happen until the Transition of mankind to the next cycle of life. Consequently, humanity can completely concentrate on the process of the Transition. The beginning of the last stage before global cataclysms. In the chain of continuous expansion of the ozone holes, revealing constant weakening of the planet’ magnetic field extraterrestrials have identified 1998 as the beginning of the last phase before the global cataclysms, and, then, and the upheaval of the poles. ETC designated for humanity that stage by two huge pictograms. One of them is the crop circle in England in the form of a solenoid coils which were made in the form of the magnetic hysteresis loops - symbols of the magnetic field. Second – is a huge picture of a man with a stick in his left hand in Australia. The pictograms on the fields about critical decreasing of the planet’ magnetic field. 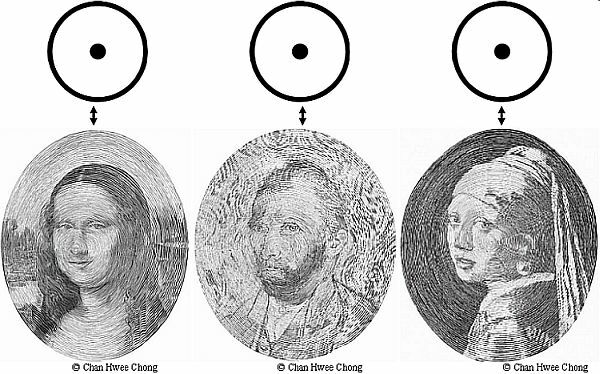 Beginning from 1998, on the fields of England, appeared a lot of pictures that contained symbols of the magnetic field – the hysteresis loops and chess design. These pictograms indicate a critical weakening of the magnetic field of the planet. On July 22, 2000 exactly 2 months before disclosing of the huge ozone hole in the fields of England appeared pictogram, resembling the distribution of magnetic field lines. This way extraterrestrial civilizations paid humanity’ attention on a critical state of planet’ magnetic field, leading to the destruction of humanity and pointed the only way of life continuation – the Transition to the safe Highest level of the material world. The Marree Man. Came year 1998... On September 19, 1998 opened a huge ozone hole over the South Pole, which size amounted to 2.27 million square kilometers. From that moment the sizes of ozone holes from year to year increases by dramatically throws, each time reaching unprecedented proportions. Almost three months before opening of the ozone hole, on June 26, 1998 in South Australia extraterrestrials created a huge pictogram – an image of the man with a bird's beak and a long stick in his left hand. They chose just this place on Earth, because Australia is the closest continent to the South Pole, over which every year for more than two decades are opening the ozone holes. The researchers called this pictogram «Marree Man»or «Stuart’ Giant», because the drawing is located near the village of Marree on the plateau of Finnis Springs. The pictogram of the Marree Man was included into the «Guinness Book of Records» as the largest figure in the world. Height of the picture is 4 km, the length of the drawing’ contour (outline) – 18 km, the width of the grooves, forming a line drawing, is 35 m, the depth of the line is about 30 cm. The huge size of the pictogram allows seeing it only from a big height 3,000 to 10,000 meters, as well as the Nazca Lines – huge drawings in the Peruvian desert Nazca. But the Marree Man is considerably greater than the longest of the Nazca geoglyphs «the Lizard» with length 188 meters. 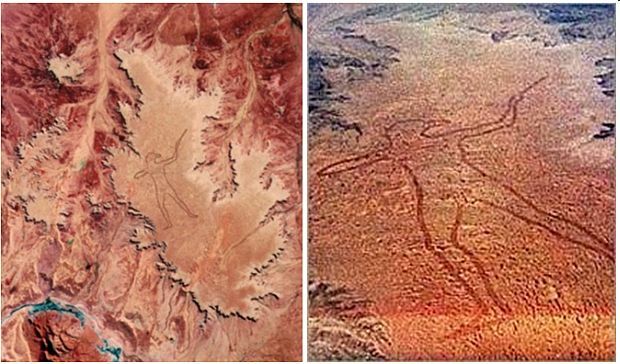 The technique of the creating of the Marrree man and the Nazca Lines pictograms is similar. They are created on the hard rocky soil plateau by one continuous line. It is deep and wide furrow created by means of information technology. The pictogram of the Marree Man has arisen absolutely unexpectedly – it was done in one night, because over the plateau constantly are circling planes, however, pilots did not see this huge figure up to 26 June 1998. Researchers believe that the contours of the Marree Man could be applied only by means of a global satellite navigation system (GPS). Decoding of the pictogram by means of symbols of consciousness extraterrestrial civilizations. The pictogram can be easily read with the «Dictionary of symbols consciousness of extraterrestrial civilizations. » Detailing of the anatomical elements on the icon shows that for its decoding it is important to determine the position of human breast and back. Let's briefly consider the contents of the pictogram. The main symbol of the symbolic of consciousness is an individual information cell of human being. Individual cell – is presentation of human being on the information level of the Universe. Like a human being, the cell consists of the brain area, body area and the boundary separating one person from another. Every individual has its particular cell, which reflects his features. At communicating of two or more people arises united consciousness. In the symbolic of consciousness it means that is formed the cell of the united consciousness with an expanded brain area. On the pictogram is presented a bird-man, because the lower part of his head shows a man's face in profile, and the upper part – the profile of a bird. Thus the profile shows the man who has turned to the right. The main idea of the pictogram –to point humanity on the necessity, as a bird, to make the Transition-flight on the Highest level of the material world into a new cycle of life. Image of bird-man found also in other pictograms of extraterrestrial civilizations, for example on the Easter Island, in the complex Tula in Peru, etc. The pictogram informs that this Transition-flight will be possible to make by means of the united consciousness of humanity. It is shown as a magic wand pointing upwards in the left hand of a man. So, this way is shown the only opportunity to continue life of Earth civilization. The pictogram consists of the right and left sides. The right hand of the man is pinned to his chest, and in the left there is a wand. The upper part of the left forearm consists of two semi-ovals that depict merging of two individual cells, that is, two people who have united consciousness. Two combining individual cells form a single cell of the united consciousness. As a result of unification of people consciousness in each individual cell happens a shift of the brain area from the center to the border. In the symbolism of consciousness of extraterrestrial civilizations, this shift of the brain area at the unification of people’ consciousness is shown as a long, narrow rectangle that looks like a wand. Wand in the hand of the bird-man. It represents a shift of brain area, as a result of the unification of civilization’ consciousness with a common goal. This unification of consciousness in the physical world will cause an action leading to magical transformations. In fairy tales such transformations usually causes a magic wand. A similar wand, for example, had the fairy in the tale «Cinderella». The action of the united consciousness is indeed magical. It can lift into the air, causing levitation, move objects, and keep a tennis ball in the air – telekinesis, reveal future events – clairvoyance, etc. Huge size of the Marree Man means that wand in his hand is the result of unification of consciousness of all people on Earth with a single goal to make the Transition into the new cycle of life. Consequently, at the same time in all individual cells of our civilization the brain areas have been shifted. The wand in the hand of the bird-man shows a laser beam, which causes the unified consciousness of humanity. The laser beam is required for the destruction of the body from the level of crystal structures – the level of global cataclysms. At the same moment at the Highest level of the material world all people will resurrect-arise with new holographic bodies without injury or illness. The symbol of the Transition – is a bird. Therefore, that's why the profile of a bird is looking at wand. 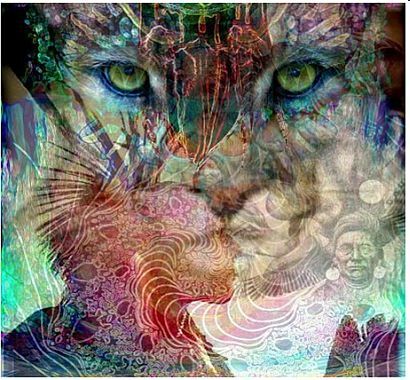 Thus, uniting consciousness and causing the laser beam, as a sacred Phoenix, humanity will make the Transition-flight from the lower level of the material world to the upper safe level, reviving in a new cycle of life. The wand is just in the left hand of a bird-man, because at the left side is placed the heart. This emphasizes that the unification of human consciousness have to be done on the basis of love, that is, the main principle «love the neighbor as the self». By creating the pictogram of the Marree Man on June 26, 1998 extraterrestrials thus notified humanity about the coming of the last period of the critical weakening of Earth magnetic field. The Marree Man indicates on the beginning of global cataclysms soon. Thus, the pictogram points the necessity of the Transition to the Highest level of the material world for the continuation of life through the union of consciousness. According to the certain algorithm of the consciousness’ development in the solar system, there are special mechanisms to coordinate the evolution of the highest consciousness on the planet – consciousness of mankind. In the last, final, the highest phase of development of the civilization’s consciousness happens the following. There are two modes of consciousness – individual and united. The individual mode of consciousness is characterized by a desire to «take», and the united mode of consciousness – by the desire to «give». United consciousness is the highest level of consciousness in the universe. When the development of individual consciousness of humanity in harmony of the given planet reaches the highest level, it is necessary to complete its cycle of development and to transfer to the next system of improvement – the cycle of Correction. Otherwise its rotting and degradation will begin. However, to complete the cycle, consciousness has to attain the highest level not only in the mode of individual consciousness, but also in the mode of the united consciousness – the highest for the universe. Therefore, for the Transition to the next cycle of life, humanity has to change the mode of consciousness from individual to the united. It means that is required to replace the desire to «take», by the need to «give». However, this change is extremely difficult and even, to some extent, an insoluble task, because changes a basis of everyone’ consciousness. At the first cycles of development of individual consciousness, when it is not very perfect and under no circumstance never wants to «give» – there is a special mechanism that forces humanity to unite consciousness under threat of total destruction. This way, the highest level of consciousness is achieved at the end of cycle on the planet. This mechanism is based on the abilities of consciousness and is as the following. On the planet two processes are combined – the development of consciousness, and changes of the planet’s magnetic field value. The higher becomes level of consciousness of the civilization living on the planet, the weaker its magnetic field. And finally, there comes a time when the planet's magnetic field decreases to a critical value, corresponding to the start of global cataclysms. Civilization, consciousness of which has reached the highest development, has to inevitably perish, because the planet where the perfection of consciousness has ended, is subjected to the total destruction. At this point, extraterrestrial civilizations inform us that the only way to save life is to use the action of the united consciousness, which will allow making the Transition to the Highest safe level of the material world where disasters do not exist. There will begin the next cycle of life – the cycle of Corrections. Extraterrestrial civilizations give all the Instructions - how to unite consciousness, what structure it should have in order to cause the strongest effect, etc. Thus, there is very short time for training and the Transition. Therefore, only by unifying consciousness civilization will continue its life. Otherwise, it will be destroyed by global catastrophes. Thus, only mortal danger of total destruction could force civilization to unite consciousness. This way is achieved the highest level of consciousness in the harmony of the given planet. Gradually after several cycles of life on the planets, consciousness of mankind completely transfers into a mode of the united consciousness. Only then to the civilization the universe will be opened, and the possibility of intergalactic flights will arise. Extraterrestrial civilizations inform, that humanity of Earth will get these possibilities already after Mercury, when will make the Transition to the planetary system of another star – not the Sun. This new system, in which we-humanity will live, will be smaller and consist of six planets. After perfection of consciousness on all six planets of the new planetary system, we will transfer to five individual planets. This is the algorithm of our future. However, it may not happen if civilization does not unite consciousness in time – before start of global cataclysms – and will not make the Transition into the next life cycle. Today Earth dwellers first become acquainted with the possibilities of their consciousness, which allows making the transition to parallel worlds. Already in the next cycle, humanity will master flights not only to Mars, but also to the distant planets of the solar system and then we will discover for ourselves flights in the universe. Extraterrestrial civilizations have done a great job on our planet – they created worldwide huge majestic complexes-pictograms in order to inform humanity about the coming events. However, mankind stays idle. Today it is already clear that before December 21, 2012 humanity will not make the Transition on another safe level of the material world – after all we do not believe that cataclysms will begin. For this reason, we should make the Transition in extremely severe conditions and in very short terms. Consciousness of people of our civilization still is imperfect and causes too weak action. Therefore, the laser beam for the Transition can cause only a huge number of people – the whole civilization of Earth, simultaneously, synchronously unifying consciousness. And we will make it. Transition is a triumph of the highest consciousness of Earth mankind. This is a great victory of mutual aid in the universe. The cycle of development of consciousness of the universe will end by the unification of all the galaxies. Our Transition should be based on well-known Principle – love the neighbor as yourself. Edgar Cayce, well-known American prophet warned about coming global cataclysms. But from Russia will come the hope of the world. It will be not communism, no, but a society based on the principles of brotherhood and mutual aid in which everyone will be responsible for each other. Thus, Edgar Cayce talked about the unification of consciousness of mankind. Just about this – about the necessity of unifying consciousness of humanity for the Transition as the only way of salvation from a global cataclysm inform extraterrestrials. And we – Russian scientists decoded their messages-pictograms and transferred its content around the world. The transition to the new cycle of life can be made through the synchronous unification of consciousness of all humanity, based on love and mutual understanding. All people of Earth have one destiny, because can not leave the planet and have to feel great joy because have the opportunity to continue life through the Transition. We will make the Transition, despite on very short, but sufficient amount of time. Extraterrestrial civilizations remind that it is necessary to limit the amount of food consumed, and even remove one meal. Reduce or even completely stop the consumption of meat and fish. However, it is necessary to consider a state of health.